Anti and MEPIS announced a few days ago the release of the latest version of their Linux distribution, antiX MEPIS 7.5, codenamed "Toussaint Louverture." It brings some new additions, like the antiX Control Centre and the smxi script, and some improved features such as the Fluxbox and IceWM window managers. Particularly useful to users keen on having a very fast and configurable system, this lightweight OS is based on the MEPIS Linux 7.0 core, featuring the MEPIS 2.6.22 kernel and utilities, together with certain additions from Debian Lenny. Probably the highlight of this release, the antiX Control Centre is a feature based on community contributions, which brings many settings (desktop and system management, network tools, hardware configurations) all in one easy accessible place. Another new presence is the smxi script, which gives the user the option to manage the kernel and driver upgrades more easily, while allowing three kernel version possibilities: default, sidux and Debian Unstable. Community support is strongly felt, mainly thanks to the MEPIS Wiki and User's Manual, the antiX MepisLovers forums and a revised set of FAQs. The Fluxbox and IceWM window managers have been given new and improved interfaces in order to enhance functionality and appearance. 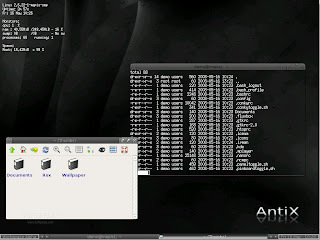 Like the two pre-installed WMs, Conky and ROX Desktop are also available and ready for use. An important mention would be the fact that all applications, including Abiword 2.6.4 and Iceweasel 3.01, have been upgraded to correspond to the Debian testing versions. In order to upgrade to this version, you can use the available script which permits you to get your system from 7.0 or 7.2 to 7.5. Looking to give users as much setup flexibility as possible, antiX MEPIS 7.5 comes in a base configuration, strictly needing only 64 Mb of RAM, and Pentium II or AMD equivalent processor. Download MEPIS AntiX 7.5 right now from here.